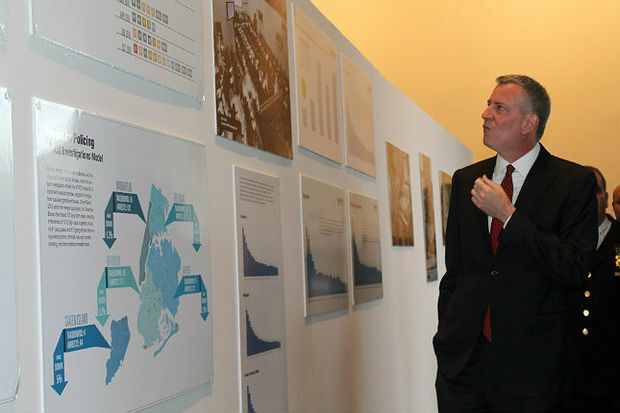 Mayor Bill de Blasio views an NYPD photo exhibit at the Brooklyn Museum on Jan. 4, 2017. PROSPECT HEIGHTS — Mayor Bill de Blasio defended his decision not to respond to the scene of the Long Island Rail Road crash in Brooklyn, saying "it did not seem like the kind of incident" he needed to address in person while holding a separate press event about a mile away. While Cuomo and and MTA Chairman Thomas Prendergast spoke publicly from the scene of the crash Wednesday morning, de Blasio joined NYPD Commissioner James O'Neill at the Brooklyn Museum to view an NYPD photo exhibition curated to accompany a subsequent press conference announcing historic crime drops in the city last year. The exhibit was taken down once the press conference ended, according to a Brooklyn Museum spokeswoman. De Blasio — who chided Mayor Michael Bloomberg in 2013 for not appearing at the scene of a fatal Metro-North crash in the Bronx — said he was briefed about the LIRR crash right after it happened. “The most serious injury we know of to date was a broken leg, so it did not seem like the kind of incident we talked about years ago when there was a horrible tragedy,” he said, when asked about the Metro-North derailment. As mayor-elect in 2013, de Blasio said he would be more transparent during his tenure at City Hall. “For me it would be, generally speaking, important to be there,” he said then, according to the New York Times. Kenneth Sherrill, professor emeritus of political science at Hunter College, said he doesn't understand why de Blasio, who is running for re-election, would not have stopped by the scene of the crash. "The first responders were city police and firefighters and one would think the mayor would want to thank them for their good work, congratulate them, ask if there is anything he can do to help," said Sherrill. "Yes the MTA is the governor's domain but the police department and the fire department work for the mayor." Even "more bizarre" is that the mayor skipped going to the crash to attend an event acknowledging the good work of the police department that was held only about a mile away, said Sherrill. "The Brooklyn Museum is close to where the crash happened so it makes you wonder about his political instincts and the political instincts of the people around him that no one said go over there and thank the cops and firefighters and say: 'Here is another example of the wonderful job they did last year,'" said Sherrill. "We know he's had trouble with the PBA and the fire union does not love him, so for him to walk away from an opportunity like this, his campaign consultants have to be slamming themselves in the head," he added. De Blasio and Cuomo have been engaged in a long-running and nasty public feud that has seen them both awkwardly handle coordination of major public events and even public safety issues. Most recently, de Blasio said he didn't know if he would be invited to the opening of the Second Avenue Subway, one of the largest expansions of the subway in 50 years. The mayor and the governor also were operating separately near the scene of the Chelsea bombing in September before they finally held a joint tour of the scene. During 2015's outbreak of Legionnaire's disease, the two men held dueling press conferences and gave contradictory information. "I can understand his thinking that this is the governor's domain and he might be a little gun shy of seeming to horn in on the governor's domain, but it is a little bit odd that he missed the opportunity to be photographed there," said Sherrill. The mayor called Wednesday's incident “contained,” noting it did not affect subway transit since it was at the end of the LIRR line. Cuomo, speaking in Midtown, also called the crash a "minor accident" in spite of the number of people who were injured. De Blasio added that he did not cancel plans to speak at the NYPD event because crime statistics affect the entire city.